Way to the Stars is a free adventure game app for Windows 8 and 8.1 computer, it is an addictive game with a different game style and mode. The background story of the game is that the little aliens is stuck on earth in a barn as his flying saucer ran out of fuel and he attempted emergency landing and crashed down. 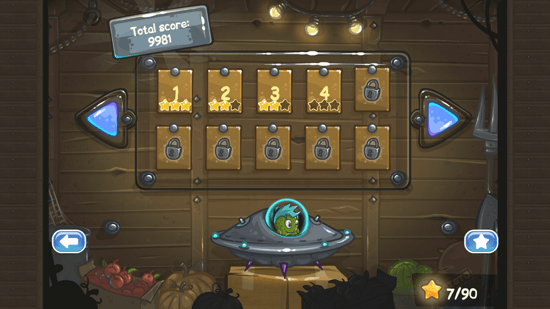 The aim of the game is to help the little aliens escape the barn and find some fuel in order to fly back in the stars. 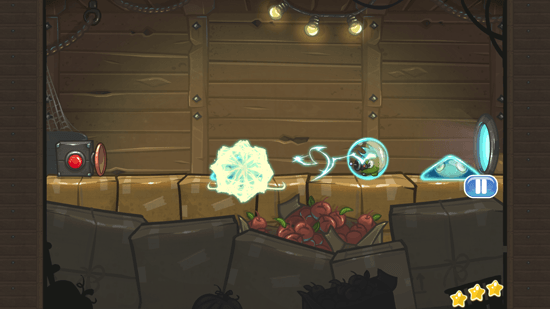 In the game, the little green alien is the main character and the other aliens can take transform into different shapes such as a triangle, rectangle, circle, etc., to help the green alien collect the stars and move to the next level. The challenge of this adventure game is to collect the stars placed on different places on the game environment. The graphics of the game are beautifully designed, it has nice colors and nicely placed objects at different places in the background. The background of the barn has different styles but of same color. The stars are of bright golden color with a glow around them. Sometimes the stars keep floating in the air making it difficult to collect them. You will also get a small machine having a red button and a lever that can push the little green alien to move. As the game keeps going to different levels, you will face new challenges in successfully achieving the stars. The game is engaging and can easily become an addictive adventure game. In addition in being an adventure game it is also a brain challenging game as you have to decide when do you need to change the shape of the other aliens so that the main character is able to clear the stage by collecting the stars. Get Way to the Stars.